Hidden in a secluded Cotswold valley, untouched by time and the modern world, lies Woodchester Mansion, an unfinished masterpiece of Victorian building. Designed by the brilliant young architect Benjamin Bucknall for the wealthy Catholic William Leigh, the mansion is a remarkable synthesis of French gothic revival theory and the local Cotswold tradition. Visit the Mansion and step back 140 years into a Victorian building site. Nowhere else is the anatomy of a great house laid bare as a timeless masterclass of architecture, building craft and sculpture - to accommodate a family and servants who never came. The Mansion is almost entirely constructed of golden limestone, from the half carved gargoyle to the bats on the belfry; from the massive stone bath to the delicate tracery of the rose window in the chapel. Original wooden scaffolding still supports unfinished walls. See the stages of plastering with lime and how a vaulted ceiling is constructed. The Woodchester Mansion Trust is a conservation charity founded in 1989 by a group of local professional people supported by the community. The Trust leases the Grade 1 listed mansion from its owner Stroud District Council, and is assisted by English Heritage. The aims of the trust uniquely combine historic building conservation, education and public access. Incorporating training programmes whenever possible, the Trust will repair, but not complete, the Mansion, so that it will remain forever an 'unfinished masterpiece'. An important objective of the Woodchester Mansion Trust is to improve professional and public knowledge of traditional building skills and stone conservation. It is working with major educational establishments concerned with architecture, conservation and craft training standards. Near the village of Nympsfield, 5 miles south of Stroud, 15 miles south of Gloucester. Just off the B4066 Stroud- Uley - Dursley road (scenic route). 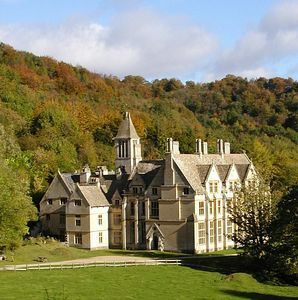 There is no access to the mansion from the village of Woodchester. There is a car park for visitors and free mini-bus service down the one mile woodland track.